It’s hard to believe that it’s been thirty one years since I climbed Liquid Sky. 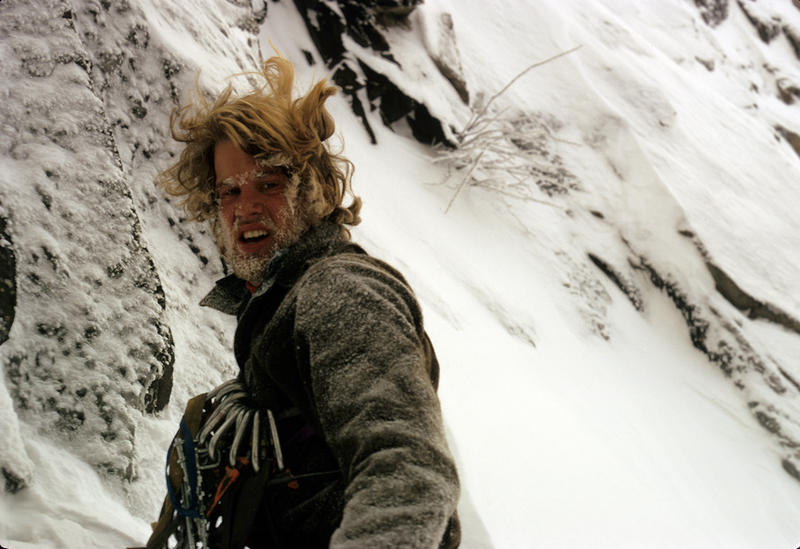 Climbing has changed a lot in the past three decades. Here is a piece I wrote about the first ascent that was published in Alpinist #28. In April 2013 Jim joined an international team, as camera operator for Greenpeace, that ventured to the North Pole, where they declared it protected on behalf of all life on Earth. Backed by millions, they planted a flag for the future on the seabed and called for a sanctuary in the uninhabited area around the pole. See more pictures and read about the trip in The Conway Daily Sun’s link below. In February Jim traveled to Japan to shoot an international Greenpeace alpine team delivering messages of support and hope for the victims of the nuclear disaster at Fukushima Daiichi to the summit of Mt Fuji. Collected from thousands of people in Japan and all over the world, Greenpeace hopes that these messages will help unite the people of Japan in opposition to nuclear power, and encourage the Japanese authorities to listen to them. At the same time, another group of Greenpeace activists unfurl a banner at Lake Kawaguchiko, in the shadow of Mt Fuji. Climbing team was comprised of eleven alpinists from Canada, France, Germany, Hungary, Italy, Poland, Sweden, Switzerland and the USA. Joe Josephson recently asked us to shoot a short interview with Rick Wilcox for the Bozeman ice festival. Having grown up with Rick’s stories since high school, I realized this was a great opportunity for others to hear some of Rick’s classic tales of climbing with a few of our sports most influential characters.